Warning! If you have a swarm of bees that are threatening the safety of you, your family or your neighbors, don’t hesitate – call your Ladera Ranch bee removal experts at Bee Busters! Ladera Ranch in California is a popular destination for tourists and travelers, like many places in the Orange County area. People who love parks and museums will have plenty of options that are located in Ladera Ranch or nearby. Anyone who enjoys golfing will be able to find plenty of excellent golf courses in the area. There are also a number of interesting local historical sites to visit, such as the Los Rios Street Historic District in nearby San Juan Capistrano, one of the very earliest points of European colonization on the West Coast. 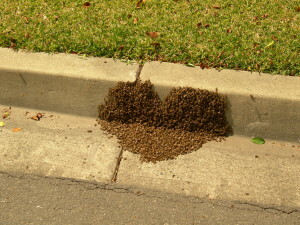 Unfortunately, the area is also a popular site for colonization by honeybees as well! For many residents and businesses, the Ladera Ranch bee removal and control services provided by Bee Busters, Inc. are essential. There a number of distinct varieties of these insects, and many of them can act as pests. Bumblebees are actually capable of stinging a person multiple times each, and they will often fly after real or perceived trespassers for a relatively long time. While each honeybee is limited to one sting, they can still be persistent threats. Most varieties of this creature will sting almost anyone that they find sufficiently threatening. No one should have to constantly live in close proximity to insect neighbors that make them uncomfortable. If you need Ladera Ranch bee removal assistance, call Bee Busters! Homeowners that have bee infestations of any kind may find themselves having to work around those bees in order to avoid disturbing them, which can have a negative impact on their quality of life. Can you imagine living in the constant fear that a homeowner will bump your hive or spray you with the hose — err I mean living with the constant threat of bee stings is stressful for homeowners. For people who suffer from allergies related to stings, a dependable bee control service is a must! 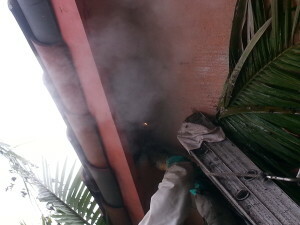 We specialize in bee control and removal so you can depend on us for reliable swarm removal and quickly resume your normal habits without the intrusion of bees. We are a local company – truly your Ladera Ranch bee removal experts! We perform hundreds of Ladera Ranch bee removals every year. We do removal and abatement of regular (European) and Africanized (“killer”) bees from trees, houses and commercial buildings. We are not only bee control experts, we are also beekeepers. 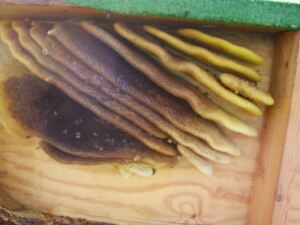 We always encourage beekeeping as a hobby and we are glad to help someone get started. Local people interested in addressing their bee problems can contact Bee Busters, Inc. at (949) 497-6264. Residents are always advised to get professional assistance with their bee problems. Call your Ladera Ranch bee removal experts today!